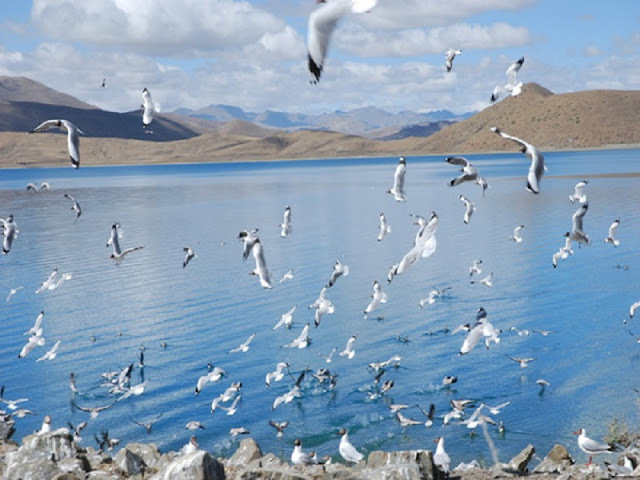 Yamdrok Lake, as a beautiful and pure lake at an elevation of about 4441 meters above sea level, together with Lake Manasarovar and Namtso Lake, is considered as the top three holy lakes in Tibet. 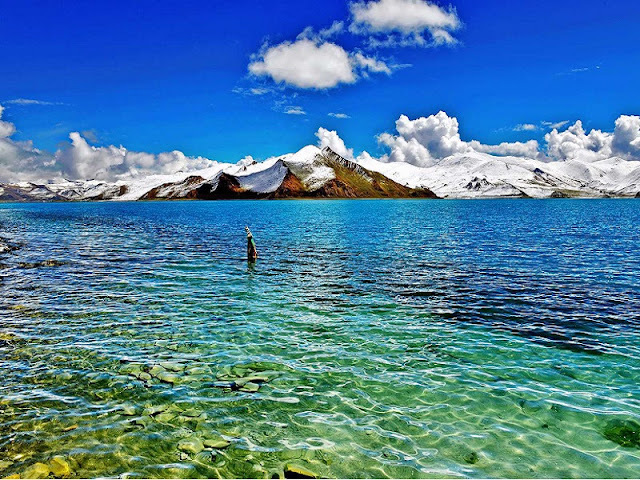 Located on the south bank of the Yarlung Zangbo River in Shannan Region of Tibet, Yamdrok Lake is surrounded by a lot of great snow mountains. It was formed by a big river which blocked by the falling of giant glacier about 100 million years ago. In Tibetan, “Yamdrok” means a lake of jade lies in the heaven and it's considered to be the turquoise earrings dropped by Goddess. As a vast inland lake with an area of 675 square kilometers, Yamdrok Lake appeared fantastic blue, like a sapphire on the Shannan Plateau. 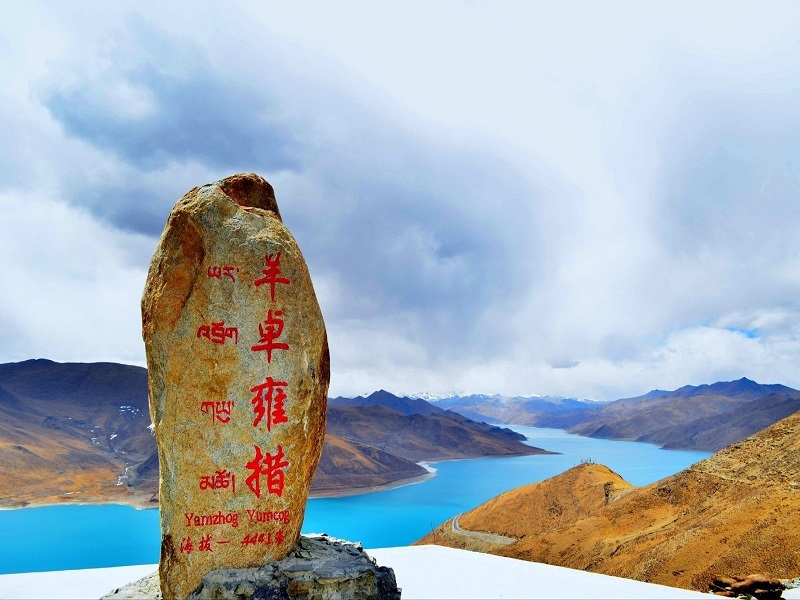 Yamdrok Lake is situated in Nagarzê County, Shannan Region where is an area to the south of Lhasa in Tibet at a distance of about 100 kilometers. The best route getting to Yamdrok Lake is along the road between Lhasa and Shigatse. You can get to Yamdrok Lake by taking a bus from Lhasa to Nagarzê, but we strongly suggest you hire a private car to have a better experience along the trip. It's about 2 hours driving before arriving the Kambala Pass which is the best place to overview Yamdrok. It will take another half an hour to drive in the winding road if you want to be more closed to the holy lake. According to legend, Yamdrok Lake is formed by a goddess who descended to earth from heaven. Once upon the time, Yamdrok Lake was a lake with pure and green water. A beauty lived in a village called Terre-Blanche beside the lake. Every night she bathed in the lake and this made her skin as mild as white jade. Unfortunately, a serf owner in the village lusted after her beauty and wanted to possess her. But the girl refused because she had been in love with someone else. The serf owner didn't give up so he hid in the lake and grabbed the pure girl when she bathed there one night. Just at that moment, A fairy, who was standing on a colorful cloud, came and took the evil soul of the serf owner away by prayer beads. However, the dead didn't let her go and sunk into the darkness of the lake bottom. The next dawn, villagers came and searched the innocent girl along the lakeside, suddenly a white waterfowl came out from the lake. Everyone present believed that the waterfowl is the incarnation of the dead girl. From then on, many white waterfowl have been always swimming and flying there. 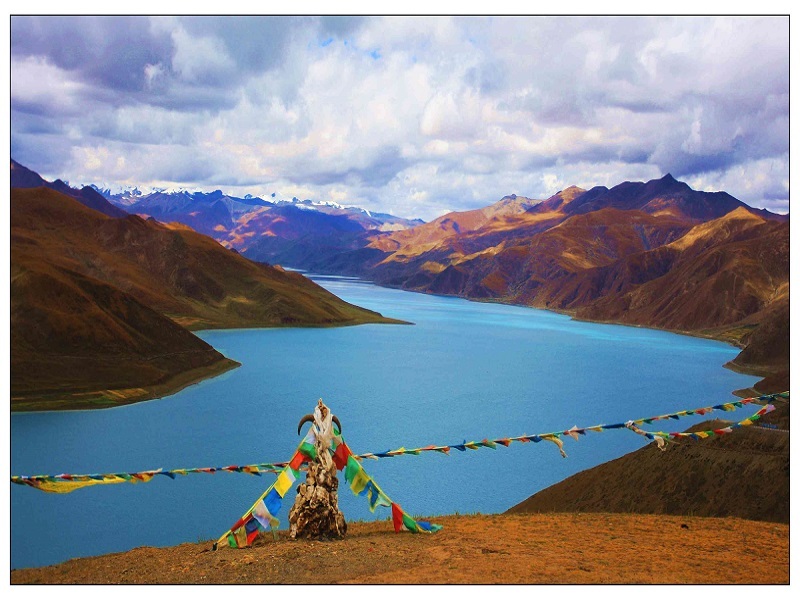 The tale makes Yamdrok Lake a holy lake in Tibet. Yamdrok Lake has been hailed as the most beautiful water in the world. The exquisite lake and mountain scenery complementing each other. The picturesque landscape there makes Yamdrok Lake a holy and beautiful paradise on earth. Yamdrok Lake is a unique natural scenic spot with a combination of lake, snow capped mountains, islands, meadows, hot springs, wildlife, and temples. The lake is also called “the lake of coral in heaven” because it appears in a shape of coral by taking a bird's eye view. On a sunny day, Yamdrok Lake shows extraordinary blue in various of levels. There are magnificent snow mountains which reach a height of over 7000 meters with the perpetual snows on the top. Yamdrok Lake is an indispensable part of the divination ritual in searching the reincarnated soul boys of Dalai Lamas. It's said that an image of the newborn Dalai Lamas will appear on the lake surface to show the direction of the divine soul. Many pilgrims come and take more than a month to pray around the lake. They believe that they will be blessed by the Buddha in the following one year.